India’s history ranges thousands of years and it is something that makes all Indians proud to be a part of it. India is the same country where people proudly boasts its history that includes epics like Mahabharata and Ramayana that mentions the rich archives of knowledge, grand infrastructures, the vast wealth and many many temples. However, many are lost or destroyed due to the age long invasion and rules of the Mugals and British empire. What is more sad is that the temples were not just destroyed but converted into Mosques. Places which once used to echo in the songs and chants of ancient Sanskrit music, prayers and slokas have no trace of even a Hindu dust around today. The Muslim rule in India robbed off India from some its most precious treasures in terms of temples and knowledge centres. It is said that almost 3000 temples were either destroyed and left in ruins or it were used to construct Islamic Dargahs, Mosques, Khanqahs, Mazars, Tombs. Out of thousands of them, here is the list of 10 of such popular temples converted into a Mosque. According to the Hindus, the land on which the Babri mosque was built in 1528 is the ‘Ram Janmabhoomi’ (birthplace of the Shri Rama). But, Mir Baqi, one of Mughal king Babur’s generals, is said to have destroyed a pre-existing temple of Rama and built a mosque called Babri Masjid (Babur’s mosque) at the site. Both the communities have worshiped at the “mosque-temple”, Muslims inside the mosque and Hindus outside it. Some say that the Temple of Lord Rama at Ayodhya was pulled to the ground by Babur but some believe that the temple was destroyed by previous Islamic rulers as the mosque structure does not belong to that era. However, it is doubtless that a temple existed and people from centuries used the site to worship Lord Rama. 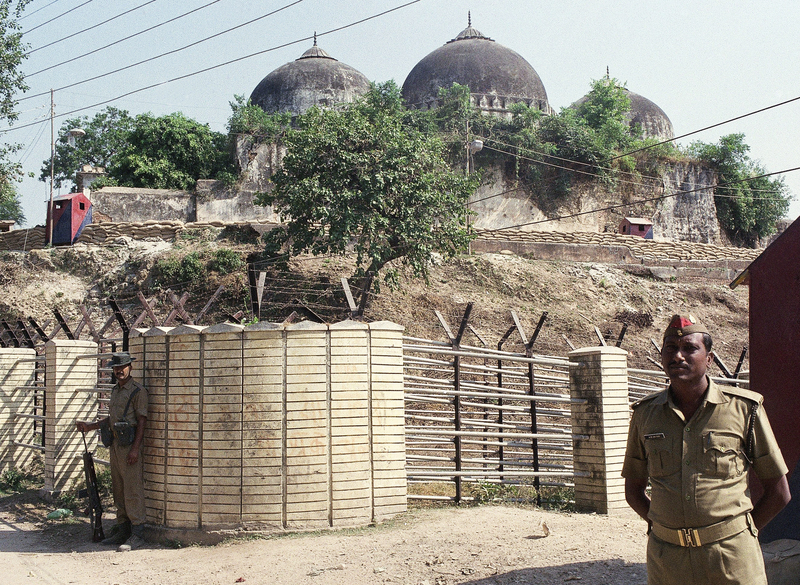 With strong archaeological evidence now available a large temple base was found at the Babri Masjid site. The Sri Krishna Janmabhoomi temple, also simply called the Krishna Janmabhoomi, Krishna Janmasthan or Kesava Deo Temple is located in the holy city of Mathura, Uttar Pradesh. Like the Dwarkadish Temple in Dwarka, Gujarat, the Krishna Janmabhoomi temple is also said to have been built by the Lord Krishna’s grandson, Vajra. Legends say that Mathura is said to be the birthplace of the god, and locals believe that the temple was made 5,000 years ago. While the mythical Yadava king is credited for its creation, the temple underwent a significant upgrade during the reign of Chandragupta II, around 400 AD. After being demolished in 1017 AD, the temple was rebuilt by Bir Singh Bundela or Vir Singh Deo, an Orchha king under the Mughal Empire. The Krishna Janmbhoomi temple was also destroyed by emperor Aurangzeb and Shahi Idgah mosque was built above the Keshava Deo Temple. It was a majestic temple and still can be seen from miles away. With the next temple only being built in 1965 after a long political dispute that is still ongoing. This fourth temple is what you see today, but the historical center of this place remains unchanged; you can still see the ancient prison cell where it is said that Krishna was born on a dark, rainy night. Inside the mosque, broken and defaced sculptures inside the mosque made up of temple ruins. There is stone installed by ASI that proudly states the fact that this site was actually made by the ruins of the temple. According to another legend, Govinddas and Madhavdas took up their haunt among the grass that covered the neighborhood of the Rudra Mahalaya. They found a shrine and Shiva Linga. This led to the erection or completion of the temple. Then the astrologers had predicted the destruction of the building. Then Siddharaj put up the images of many great kings in the temple, along with a representation of himself in the attitude of supplication, with an inscription saying that, even if the land was laid waste, this temple will never be destroyed. In 1296 AD, Mughal king Alauddin Khilji sent a strong army under Ulugh Khan and Nusrat Khan Jalesri who destroyed the temple complex. The temple was further demolished and the western part was converted into a Jami Masjid by Ahmed Shah I of Muzaffarid dynasty. Bhojshala is an ancient temple of Mata Saraswati. The temple was built in the year of 1034 AD by Raja Bhoj, the mighty Hindu King whose empire stretched from Rajasthan to Odisha and from Madhya Pradesh to Maharashtra. This temple of Mata Saraswati is situated at Dhar district in Madhya Pradesh, which was the capital of Raja Bhoj. Bhojshala was home to thousands of students and scholars and it was the main center of education. The process of Islamic attack started 36 years before the attack when a Muslim fakir named Kamal Moulana entered Malwa in 1269 AD. He used treacherous ways and converted many Hindus to Islam. He collected detailed information of Malwa region for 36 years and handed it over to Alauddin Khilji. 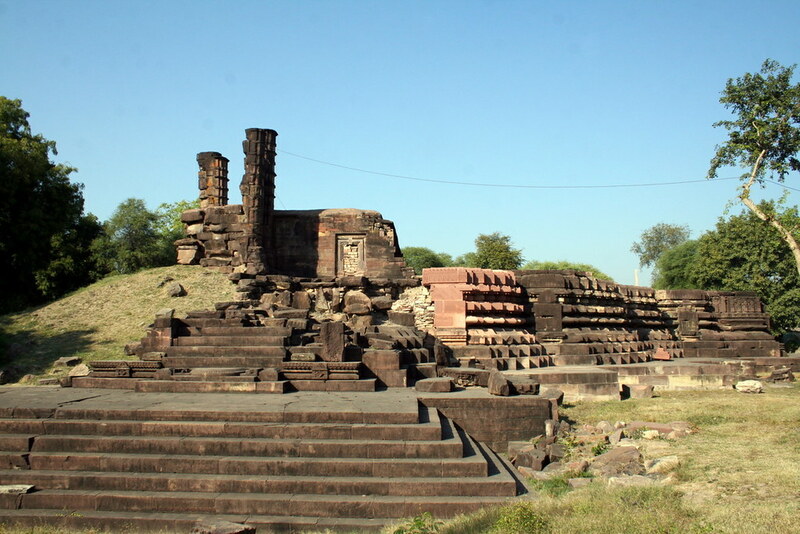 A Muslim emperor named Dilawar Khan destroyed Vijay Mandir (Surya Martand temple) and tried to convert part of Saraswati Temple Bhojshala into dargah. Today Muslims offer Namaz in this same Vijay Mandir and now conspiracy is hatched to prove that it is actually a dargah named ‘Lat Masjid’. Again, Mehmudshah attacked Bhojshala and tried to convert it into dargah. He encroached land outside Saraswati Temple and built ‘Kamal Moulana Makbara’ after 204 years of the death of Kamal Moulana. On this ground only, conspiracy is hatched to prove that Bhojshala is actually a dargah. Before 12 March 1997, Hindus were allowed to take darshan but were not allowed to perform puja. CM Digvijaya Singh issued a draconian order allowing Muslims to offer Namaz in Bhojshala on every Friday and barred Hindus even from entering Bhojshala. However, Hindus are now allowed only one day on Vasanta Panchami to enter and perform puja in Bhojshala. 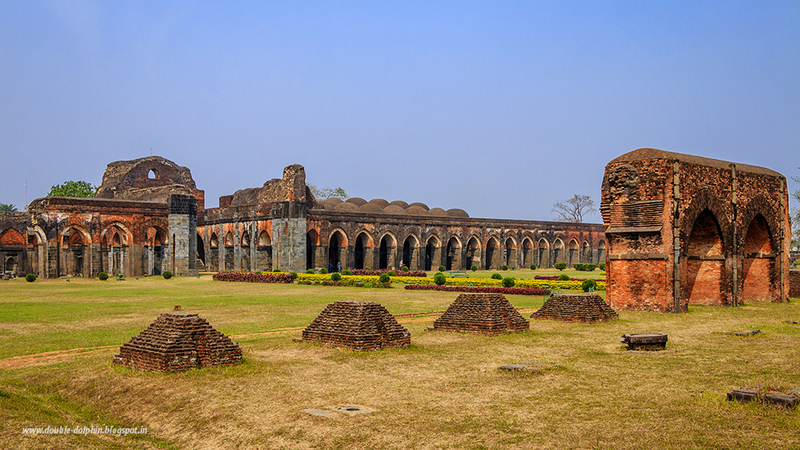 Location at Pandua, West Bengal, Adina mosque was built by Sikandar Shah in 1358-90 AD over a grand ancient Hindu temple which is now said to be one of India’s biggest mosques. Legend says that the mosque was originally a Hindu temple of Lord Shiva which was broken down and rebuilt into a mosque. The Adina Mosque has many distinct remnants of Hindu deities on the gateways and the walls of the mosque. Also, the interiors of the mosque had Hindu carvings and designs. It is one of the finest architectural structure built in Bengal. There are ample signs to show that the there was Hindu influence on this structure. One stone slab displays Ganesh while another depicts the Nataraj statue of Lord Shiva. There are several others including the crests of doorways at the entrance of the northern as well as the eastern face. Inside the mosque, the stonework is equally convincing that the original building was a temple. The name “Adina” of Adina mosque is also believed to come from the word “Adinath” depicting Lord Shiva. Jama Masjid, which was built during 1424 CE in Ahmedabad (originally known as Karnavati) made by Ahmed Shah I is originally a Hindu temple of Goddess Bhadrakali. Ahmedabad city’s original names were Bhadra, Karnavati, Rajnagar, and Asaval in different eras. The name Bhadra was named after the Goddess, whose temple was built by Rajput Parmar kings of Malwa (Rajasthan), who ruled this area in between 9th-14th centuries. Jama Masjid Ahmedabad Bhadrakali Temple. Filigree carvings of flower and Paisley motifs, lotus flowers and creepers, mandalas, elephants, coiled serpents representing the kundalini, celestial dancers and bells are found carved on the 100 odd surviving pillars that line the temple complex. If this was originally supposed to be a mosque built with a large hall for mass prayers, then there would be no purpose of having so many pillars in between. Most of the pillars are carved in typical Hindu temple style. Mosques have large halls or open places where many can offer namaz (prayer) at a time. The pillars cause an obstruction while offering Namaz whereas many Hindu temple pillars are usually carved with stories from the Puranas, Vedas, and Itihasas like Ramayana and Mahabharata. The original Bhadra fort still exists in a distorted shape. Jama Mosque is situated outside Bhadra Fort area, along with the south side of the road extending from Teen Darwaza to Manek Chowk. Ahmedabad was named after Ahmad Shah I of the Muzaffarid dynasty who captured Karnavati in 1411. He established Ahmedabad as the new capital of Gujarat Sultanate and built Bhadra Fort on the east bank of the Sabarmati river. Vidisha is a city in the state of Madhya Pradesh, around 60km from the capital city of Bhopal. Vidisha is famous for its Bijamandal Masjid and its interesting history. In India, many rich and marvelous Hindu temples were destroyed and converted into mosques during Islamic rule. The Bija Mandal Mosque is another example of the Hindu temples that were robbed, plundered, demolished, destroyed and converted into mosques using the same raw materials from the demolished temples. Today, Bijamandal having lost all its ancient grandeur stands still through the passage of time as a bitter, painful and sad reminder of the invasions and brutality of Mughals and Islamic invaders. The Bijamandal mosque was constructed using the raw materials of a demolished Hindu temple, dedicated to Goddess Charchika, which was built by the erstwhile Paramar Kings. One of the pillars at the site bears an inscription which suggests that the original temple was dedicated to the presiding deity Vijaya, the goddess, and granter of victory, and was built by King Naravarman of Malwa. This is clearly mentioned by ASI at the site. The etymology of the word Bija or Bijaya is a distortion of the original name of the Goddess Vijaya Rani. Bija Mandal or Bijaya Mandir was a temple dedicated to a Hindu goddess. The entire temple priests were massacred and the temple valuables looted during the sack by Ghazni. There is also an interesting story that Muslim invaders believed that the devils idols are kept in the temple of Al-Lat etc. and that is why it was sacked again and again. It is known that many pre-Islamic Arabians came to this temple for pilgrimage as the god here represented their moon god. Qutub Minar in Delhi was actually Dhruv Sthambh or Vishnu Dhwaj that existed even before the times of King Vikramaditya and had Arabic scripts and motifs retro-installed by Qutb-ud-din Aibak between 1191 – 1210 AD, followed by his successors Iltutmish, Alauddin etc till 1315 AD. 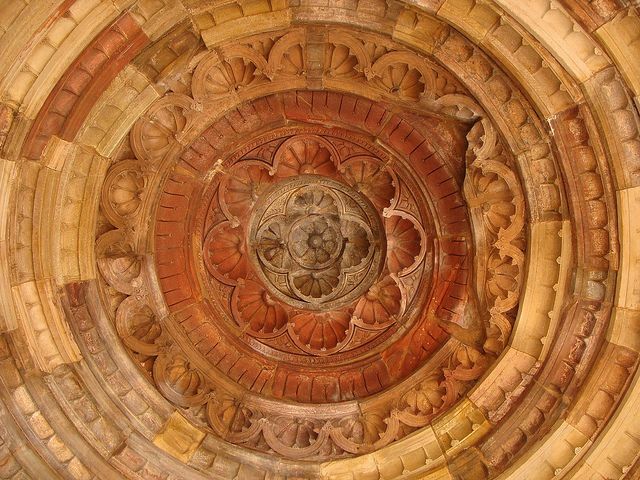 If we look at Qutub Minar from the top angle, it shows a lotus of 24 petals. Lotus is definitely not Islamic symbol, but it is an ancient Vedic symbol and the creator Brahma is said to have been born from a lotus that emerged from Lord Vishnu’s navel. There is a township adjoining the Kutub Minar is known as Mehrauli. That is a Sanskrit word Mihira-awali. It signifies the township where the well-known astronomer Varaha-Mihira of Vikramaditya’s court lived along with his helpers, mathematicians, and technicians. They used the Qutub tower as an observation post for astronomical study. Around the tower were pavilions dedicated to the 27 constellations of the Vedic Astrology. Qutubuddin has left us an inscription that he destroyed these pavilions. But he has not said that he raised any tower. The ravaged temple was renamed as Quwwat-ul-Islam mosque. The first mosque of Delhi is Qubbat al-Islam or Quwwat al_Islam which, Qutubud-Din Aibak constructed after demolishing the Hindu temple built by Prithvi Raj Chauhan and leaving certain parts of the temple outside the mosque proper; and when he returned from Ghazni he started building, under orders from Shihabud -Din Ghori, a huge mosque of inimitable red stones, and certain parts of the temple were included in the mosque.